We were lucky enough to be joined by Sophia Dempsey, Managing Director at Springwise, Neil Sebba, Finance Director at Tossed and Darren Williams, Founder of DW Exec, who all spoke alongside Lucy Stainton of LDC and Sophie Michael, Head of Retail at BDO LLP. The day was full of market insight, opinion and world-leading innovations. If you were unable to attend the event, here is a summary of what was discussed on the day. The event began introducing Sophie Michael, who has a wealth of experience in the retail sector and works with some of the UK’s most prolific retailers. Sophie began by acknowledging that monthly like-for-like sales as measured by BDO’s High Street Sales Tracker had gone into decline in 2017 and that there was no hiding the fact that the market is currently quite challenging. However, she spoke about the fact that Brexit can’t be blamed for everything, and said that Brexit only served to speed up the change that was already happening in the market. She moved on to discuss the disruptions in retail and spoke about consumer confidence, the weakened pound and the increase in online and mobile. Sophie discussed the sheer speed of change, and the fact that the retailers who can’t/haven’t adapted to the new way consumers want to shop will likely suffer as a consequence. She spoke about the importance of mobile spending and the fact that it is predicted to increase by 110% in the next year. Sophie spoke about the importance of experience in retailing, a point which is supported by LDC data revealing that experience-lead retailers are those that are seeing the best growth. Offers which can’t be replicated online seem to be performing best in growth terms. Next, Lucy Stainton took the audience through some of the highlights from LDC’s latest research on the market. Lucy spoke about the fact that whilst there are headlines across the media using language such as ‘high street bloodbath’, ‘retail apocalypse’, and ‘ghost towns’ the overall GB vacancy rate only increased by a marginal 0.2% in 2017. Lucy focused on the fact that lying underneath the headline trends is a host of information revealing how GB’s retail landscape is evolving. This included the fact that vacancy rates are worst in shopping centres and that even within this market there is a marked polarisation between those top, regional ‘destination’ centres who perform extremely well and the smaller, more local centres which are faring much worse. Retail parks continue to increase in occupancy, proving a stable retail location over the past few years. However, with the flurry of CVAs announced so far this year for brands which typically have been housed on retail parks, we’ll be tracking what impact this has on these location types. 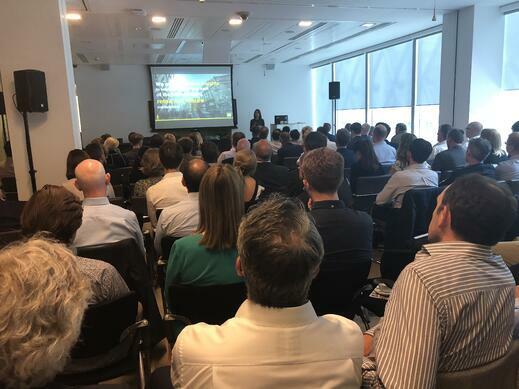 Lucy also spoke about GB’s most improved high street locations, the most entrepreneurial towns, openings and closures across all retail categories that LDC tracks and the re-occupation trends for some of the categories which saw the most closures last year. Lucy’s presentation included just a few data points from the 62 page report which is now available to download free of charge here. We then moved on to our guest speakers, the first of which was Sophia. She spoke about the fact that whilst innovation and tech seem to be moving at an incredible pace, the pace will only accelerate exponentially and that retailers should expect to be surprised by what the future will hold and plan accordingly for the unknown. She discussed the change in culture needed in innovation, and the fact that due to this accelerated pace, innovation must be built in to a company’s culture, rather than driven by separate 'innovation departments' or one-off initiatives. Sophia then moved on to discuss just a few of the innovations spotted by Springwise’s network of 23,000 Springspotters across the globe. These included; SaaS apps that help retailers be more transparent about provenance of products, a London shopping centre that converts shoppers’ footsteps into energy, biometric identification cameras to extract customer data using in-store cameras, delivery tech including robots and an autonomous grocery store vehicle which brings food to consumer’s doorsteps and AI technology which enables physical stores to run unmanned. All fascinating stuff! If you want to hear more about global innovations, Springwise have released a book, called ‘Disrupt! 100 Lessons in Business Innovation' which is available here. 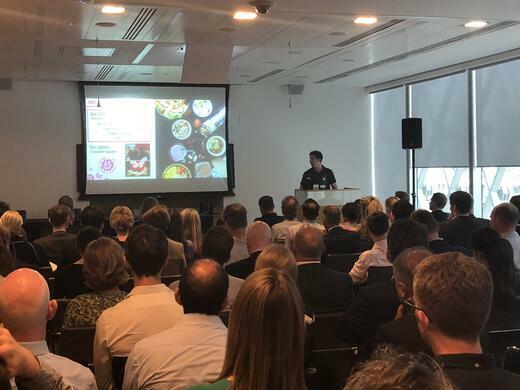 Neil Sebba then took the floor to talk about the journey that Tossed has been on as a leader in the healthy fast food market. Tossed’s USP focuses around delivering fresh, healthy food in under three minutes. Neil spoke about the fact that healthy, customisable and made-to-order food under three minutes is quite a challenge, and this is what leads Tossed to the continuous innovation that enables them to deliver on this. Neil spoke about the evolution of their store fit-out, always focusing on bright colours and more recently, moving to a cashless, self-serve system. This enables Tossed staff to focus on delivering top-quality food and allows customers to educate themselves on the products available, with no pressure and as much time as they want to browse. This system was so successful that it is now rolled across the entire Tossed estate and they have started to open stores across service stations, bringing a healthier food option to a location which has historically offered burgers, fries and the usual fast-food suspects. Tossed is now working on their mission to become paperless, improving their self-service technology with a new version of software and developing vending machines to offer products even faster to consumers. Proving Tossed are not complacent and are continuously innovating to delight their customers. 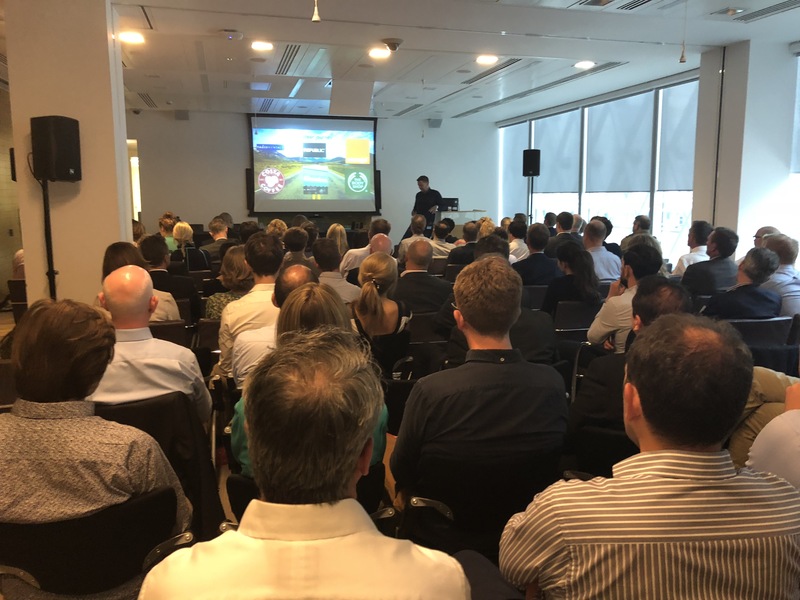 Finally, we heard from Darren Williams, who took the audience through a whistlestop tour of his career journey, focusing on the brands which have done well and which have not done so well and considering why this might be for each case. Darren reviewed Radio Rentals, Republic, orange, Costa, Unwins, The Body Shop, Argos, Hotel Chocolat, Paul, T2 and viniItaliani, his latest venture. Some of the key themes from Darren’s presentation were that he believed retailers and landlords must act now to stimulate the retail industry, and not wait for other bodies and organisations to do it. He believes that digital is the biggest opportunity for the retail industry and not the biggest threat, talking about how technology can alleviate some of the pain points that exist in running physical stores. He called on retailers to ensure that they match the pace of change in the market, as those that don’t adapt, won’t survive. Through his vast experience in the market, he has learnt that retailers needed to consistently review their estate, ensuring that all locations work the hardest they can. He spoke about the need to ensure that retailers have high-quality online platforms before they start trading, as you need to delight customers offline and online, and mistakes could cost you a lot in today’s challenging market. Finally, Darren called on retailers not to procrastinate. Many retailers have plans to optimise portfolios of stores, revamp online offerings and innovate in the sector, but these can take years to implement for some and by this time, may be already outdated or too late. Retailers must act swiftly to remain on top. Darren Williams pleas with attendees to act now to stimulate the retail market. On behalf of LDC I would like to thank all speakers at the event for an insightful and thought-provoking session, and to all of the delegates for taking the time to join us on the day. LDC’s next Retail and Leisure Trends Summit will be held on the afternoon of the 8th November, registration for which will open in September, so please ensure you are signed up to our newsletter (you can subscribe by submitting your email address into the blue box at the top right hand corner of this page) so that you receive the announcements about our events.